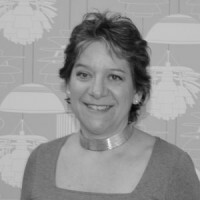 Bathrooms and wet rooms are getting more luxurious by the day and constitute a large proportion of the spend in contemporary new builds and renovations. Planning your bathroom and wet room lighting will reap benefits if carried out in advance of your new-build. This one small area has to change from being a functional zone on a gloomy winter’s morning, when the light needs to be crisp and sharp, to relaxing haven with a pre-party drink in the bath and all the scenarios in between. This can be created through a combination of layering the light, allowing for enough lighting circuits and the flexibility of dimming. 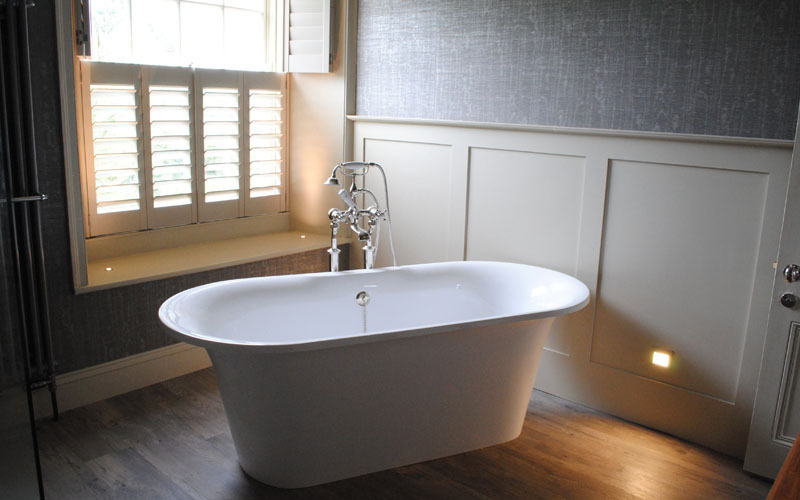 Whilst shower rooms and wet rooms tend to need only one or two circuits more circuits and dimming options will be required to optimise the mood when there is a bath in the room. 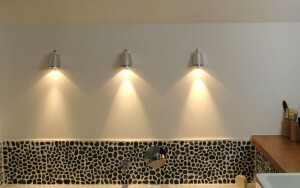 Downlights placed close to the wall will give a softer effect by creating reflected light which is gentler on the eye, however, if using dark coloured wall tiles or paint allow for a greater number of downlights as less light will bounce back into the room. Try and avoid a grid layout which tends to be flat and give thought to the style of downlight used – a dark baffle with the light source set back will create less glare, as will a fitting with frosted glass. These add the benefit of lowering the light which gives a better ambience; I tend to use wall lights either side of mirrors over basins – much better for applying make up or shaving – or even coming out of mirrors as this can enhance the space-expanding elements of mirroring. 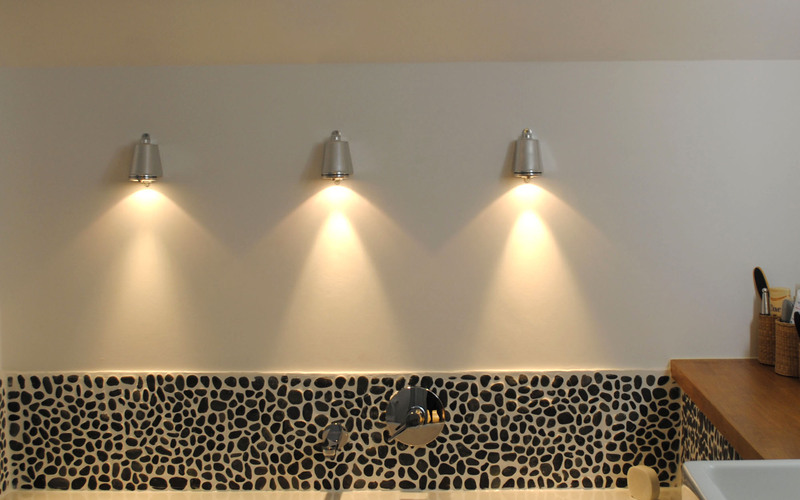 There are a vast range of bathroom wall lights on the market and don’t just look at dedicated bathroom lighting – exterior lighting can work brilliantly in bathrooms and can give a more individual feel. This is the fun part! 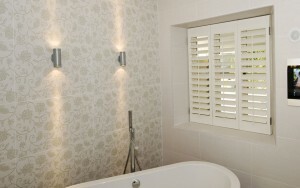 The inground LEDs washing up walls, the low level floor washers and don’t overlook alcoves which, when lit can create an additional dimension. At the same time planning is crucial as this form of lighting can sometimes highlight any irregularities in the walls or even an unbalanced layout. Sometimes, when planning lighting with clients, it can flag up an unbalanced feel to the room and if done in the early stages the layout can be addressed. 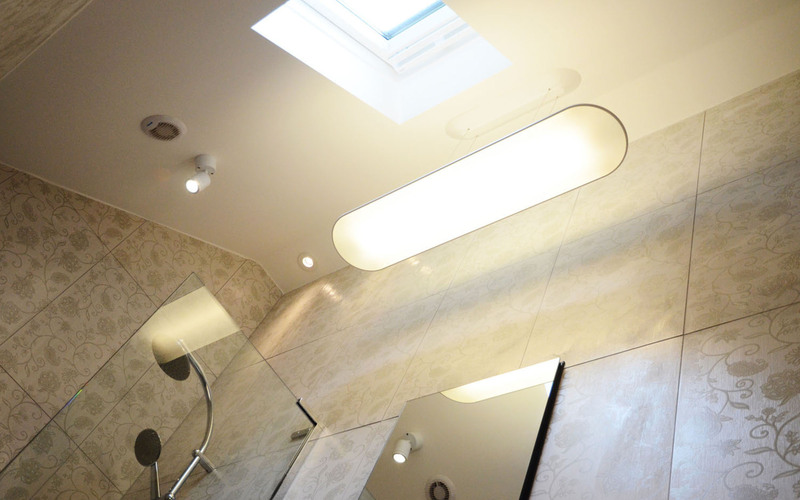 This awkward tadelakt bathroom was in an eco build with sloping ceiling; here we created another dimension by situating LED panels within recesses. 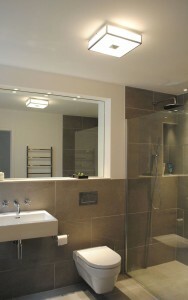 The bathroom lighting has to be easy to manage and PIRs (movement sensors) can be very useful when linked to one of the circuits; it is easier to set this on the ‘ambient’ circuit which can then double up as soft lighting for night time visits. 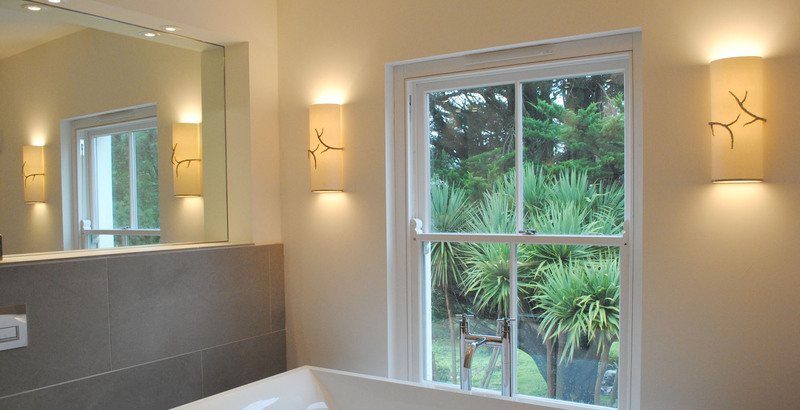 Dimmers are vital for bathrooms but not so important for wet rooms and shower rooms as they are not generally used for relaxing, however, the PIR circuit is again useful for night time visits and I don’t usually dim this particular circuit. We can all get rather muddled with our zones but in general it is better to err on the side of caution and largely dismiss any of the plans that show areas where you can use standard light fittings. In reality it probably isn’t going to happen! The electrician is going to have to sign off the work and he may be reluctant to sign off a bathroom with an IP20 fitting even with a high ceiling so although technically you may be well away from any source of water he would need to be very amenable to agree to this. 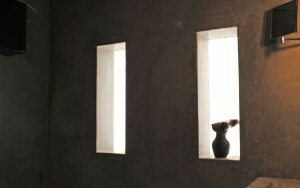 Generally I would opt for IP44 as the mildest light fitting and a minimum of IP65 in shower enclosures. In theory these can be mains voltage as long as they’re fitted with a 30 mA RCD (ie so that the electrical supply cuts out if there is any water/electricity mix present) – in reality, again, the electrician may insist that these are low voltage to be on the safe side. IP65 downlights in a standard height ceiling above the shower would be fine but if you were to specify exterior surface mounted spots in shower areas where there is a sloped ceiling it would be wise to run it by the electrician beforehand. It is also worth noting that the low voltage fitting should have a remote transformer as an integral one would be just as vulnerable as a mains fitting. Work out where you’re going to put the driver or transformer during the early stages of the build – ensure that access to this is relatively easy, eg a cupboard or in the attic.